It’s so funny that you’re posting this. I’m about to head into the kitchen to make my mom’s mandelbrodt, which was passed on to her from her mother! Her recipe varies from yours, but the cookie turns out quite similarly in appearance! Yours look great!! I adore mandelbrodt. It brings back such fabulous memories! @justJENN – Don’t be fooled–Passover stuff always looks better than it tastes. I usually just make flourless chocolate cake – good, reliable, and doesn’t taste “passovery” – but this year, my mom and I are branching out. We talked about making mandel bread, actually! I’m in charge of brownies and a chocolate/whipped cream roll. I’m excited to try something new, actually! Oh yeah, and forgot to say, these look good! These do look awfully good, but that might be all the chocolate talking to me. I’ve never had mandelbrot. 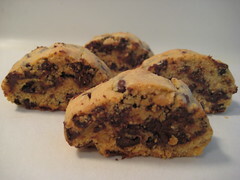 How similar would you say it is to chocolate chip cookies or biscotti in texture or flavor? @Seanna Lea – Seanna Lea, it’s been described as Jewish biscotti. Here’s my Aunt Helen’s (award winning) recipe that I make when it’s not Passover: http://noshwithme.com/2008/10/aunt-helens-mandelbrot/ it’s delicious! I’ve got the four logs bakin’ away in the oven as we speak! I messed up though: I measured out the vanilla extract with a teaspoon and then absentmindedly emptied out the bottle of vanilla extract instead of the teaspoon. A new bottle, too. Eek! I’ll let you know how it comes out. I’ve intended to comment here for so long. Just want to let you know this is the BEST recipe ever. Everyone, and I mean everyone adores it. People don’t even know it’s a Passover recipe, they think it’s just yummy biscotti ! The only thing I add to it is some course salt on the top before goin in the oven. I like to make it extra crunchy so leave it in longer. This recipe freezes beautifully as well. It’s a winner all the way around, thank you so much for sharing it!!! @Janet – Aww I love to hear that, so glad everyone enjoys them!